OUR KOREAN KITCHEN is a celebration of the food, culture and flavours of Korea, a cuisine that is fast becoming the biggest trend in the culinary world. Capturing this movement, it introduces us to Korean food through a collection of classic and well-loved dishes. Beautifully illustrated throughout, the book will explore the secrets of authentic Korean food. Covering an extensive range of over 100 dishes, from Korean staples such as bibimbap and kimchi to stir-fried spicy squid, sesame & soy-marinated beef and pecan & cinnamon-stuffed pancakes, catering for beginners as well as those with a little more experience of cooking K-Food. 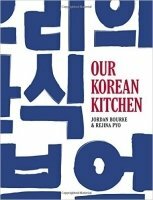 Critically acclaimed chef and food writer Jordan and his Korean wife Rejina, provide a cultural history of the food of Korea giving context to the recipes that follow. Through the discussion of Korean culture, dining etiquette, key ingredients and the role of multiple side dishes, readers will be able to prepare and indulge in all aspects of Korean cuisine. There is also an easy to navigate Korean ingredients glossary, as well as menu ideas and information on the Korean meal.